Say goodbye to dull, faded, chalky gel coat! Not all marine-specific compounds and oxidation removers are created equal! 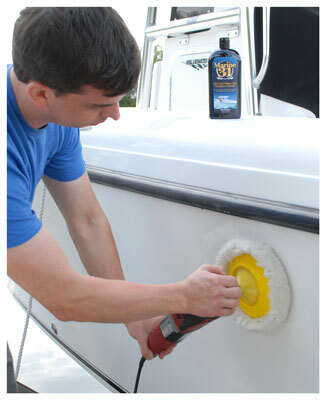 Marine 31 Gel Coat Heavy-Cut Oxidation Cleaner was developed and fine-tuned right here in south Florida, one of the most popular states for boating enthusiasts. Florida is called the sunshine state for good reason, so it was imperative that Marine 31 Gel Coat Heavy-Cut Oxidation Cleaner be easy to use, even in direct sunlight. The secret to the immense leveling ability of Marine 31 Gel Coat Heavy-Cut Oxidation Cleaner lies in its advanced abrasive technology. Marine 31 pioneered a gel coat specific diminishing abrasive that quickly and effortlessly removes heavy oxidation, scratches and chalkiness without scouring or hazing the finish. Years of neglect will disappear right before your eyes, revealing a glossy finish worthy of a brand-new boat. Unlike a traditional heavy cut marine compound, Marine 31 Gel Coat Heavy-Cut Oxidation Cleaner is exceptionally easy to use, even in humid climates. You�ll quickly appreciate its long buffing cycle and easy wipe off. Marine 31 Gel Coat Heavy-Cut Oxidation Cleaner can be applied by hand, circular polisher or dual action orbital polisher. Apply an �X� of product directly onto heavy cutting foam or wool pad and spread product over a 2� by 2� area. Circular polisher: Set speed between 1200 and 1800 RPM. Random Orbital polisher: Set speed between 6000 and 7000 OPM. For best results, follow up with Marine 31 Gel Coat Gloss & Color Restorer to further refine the surface and maximize gloss.